Brickery is an annual showcase of LEGO creations hosted by the Saskatchewan LEGO Users Group in Estevan. This opportunity allows our members the to display in the south-east corner of the province, as is the only show of it's kind in the region. Here, we display numerous creations of various themes which might have made it to previous shows, and some that are unique to this event. Our show is held in the Seniors Center of the Souris Valley Leisure Center in Estevan. This year's show will be held on Saturday, November 3rd. 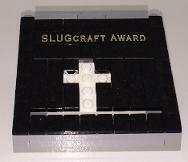 The SLUGcraft Challenge was established as a stand-alone challenge held in Estevan each year. 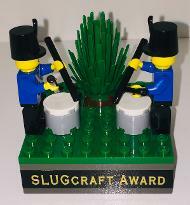 Each member of SLUG is encouraged to build for the challenge, which changes each year. The challenge builds are put on display for the visiting public to vote upon. It's winner receives a keeper trophy for their efforts. 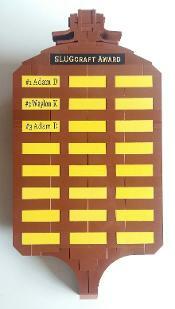 Challenge: Build an idiom (a figurative expression) out of LEGO bricks. Building Challenge #4: What's your fear? Challenge: Build something that depicts a fear or phobia. Challenge: Build something that has 'Craft' in the title. Challenge: Build a creation showing a mishap during the holidays. Challenge: Recreate a scene from a well-known holiday movie.